A Manchester, Conn.-based pet food manufacturer issued a voluntary recall of selected lots of its product due to concerns of the possible presence of salmonella.The select lots of Bravo Chicken pet foods for dogs and cats were recalled after routine testing by the New York State Department of Agriculture found Salmonella spp. Poly A contamination.Bravo Blench Chicken diet for dogs & cats – chub (item #21-102, 2 pound, best used by Dec. 5, 2016) was voluntarily recalled because of the possible presence of Salmonella. 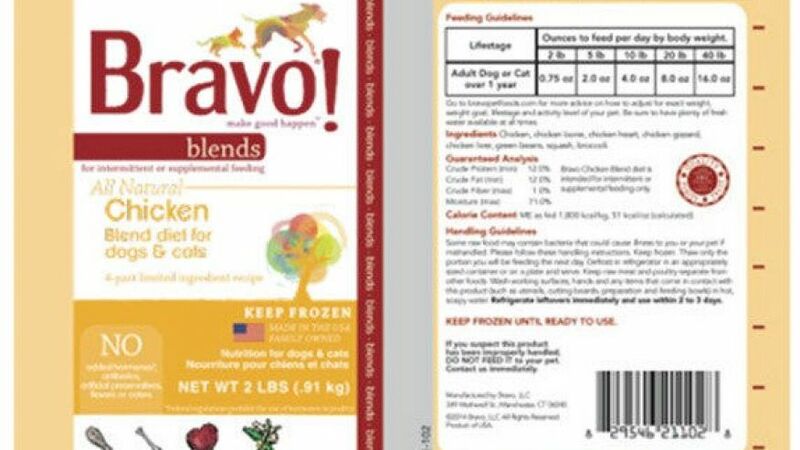 The product’s UPC number is: 829546211028.Additionally, Bravo recalled three other products that did not test positive for Salmonella, but were manufactured in the same facility on the same day as the product that tested positive.Name: Bravo Balance Chicken Dinner for dogs – PattiesItem: 21-401Size: 3-pound bagBest by: 12-05-16UPC: 829546214012–Name: Bravo Balance Chicken Dinner for dogs – ChubItem: 21-402Size: 2-pound chubBest by: 12-05-16UPC: 829546214029–Name: Bravo Blend Chicken diet for dogs & cats – PattiesItem: 21-508Size: 5-pound bagBest by: 12-05-16UPC: 829546215088The products were sold to distributors, retail stores, internet retailers and directly to consumers.According to the U.S. Food & Drug Administration, salmonella can cause serious illness or fatal infection in young children, frail or elderly people and others with weakened immune systems.